This is very subtle and office-appropriate, yet still festive. oh I don't know She's golden! it's super pretty and delicate! That's a great way to be office friendly but sparkly at the same time! @ Anne Thompson: and festive! For some reason it remided me of white baubbles. @ Polish AMOR: you lucky duck! So awesome you share them with people who do appreciate them (your blog readers). 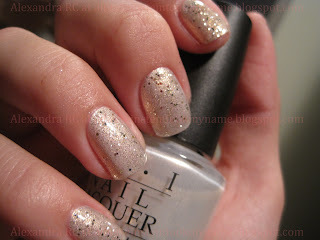 I love gold glitter, especially paired with that lovely shimmery white! It's holidayish without being all the crazy red-green stuff. 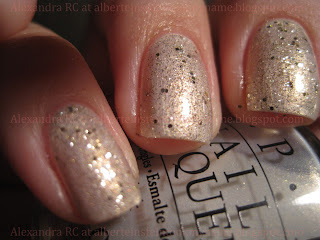 This is a nice subtle glitter manicure, nice for everday!